Welcome to the free Chicago Art Fair Calendar, offering info on the top juried Art Festivals and Craft Shows in Chicago and Chicagoland for all seasons in Naperville, Oak Park, Wilmette, Evanston, Riverside, Skokie, Oak Brook, Batavia, Geneva, Northbrook, LaGrange, and more! We hope you will attend some of these fine art events where you'll find the most interesting shopping left in America. These shows feature artwork designed and made by American artists, handmade one-of-a-kind work "not available in a mall near you." The fourth annual One of a Kind Spring Show offer 3 days of unique shopping from 300 talented makers. Shoppers will find a wide range of price points and media/categories including accessories, bath & body, ceramics, fashion, fiber art, furniture, glass, gourmet, home, jewelry, kids, metal, mixed media, paintings, photography, sculpture and wood. In addition to great food and entertainment, special Spring-oriented programming will round out the one-of-a-kind experience! Over the years, this family-oriented May event has highlighted the District through artist demonstrations, live music, dance performances and an art fair featuring selected guest artists and local crafts people. A cultural weekend in this national historic landmark community, 10 miles west of Chicago, where you'll find art, well-known musicians, a fashion show and art projects for all ages. Spend your weekend with us on our tree-lined historic streets. City living at its best! Riverside Ave. between Route 64/Main Street & Illinois Ave.
Held in picturesque downtown St. Charles on the banks of the Fox River, this show gets better every year. Free admission and parking in nearby city lots. June is the absolutely best month of the year to attend art festivals in the Chicago area. Do not miss these fine events. Celebrate the summer season with an art-filled experience at the 61st annual Gold Coast Art Fair. Take in the art action with incredible demonstrations by artists, live music, and interactive art projects. Go for a spin on the Spin Art machine to create a masterpiece of spiraled and splashes of paint. Savor the summer sun and Chicago’s stunning skyline in the city’s iconic Grant Park. Enjoy a beer, fabulous food, and live music in one of our three Food, Music & Beer Oases! This show is the oldest juried art fair in the Midwest, inspiring many imitators. One of the reasons this event mai ntains such a strong group of artists is that most of the artists are re-invited to return each year, and return they do. You will find the newest of beginners here but mostly some of Chicagoland's best artists who return year after year to a loyal clientele. 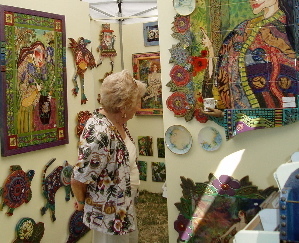 The Old Town Art Fair is a juried fine art fair with 250 nationally acclaimed artists, a garden walk, live music, a food court and a children’s corner. Artwork includes 2D and 3D mixed media, drawings, paintings, photography, printmaking, ceramics, glass, fiber, jewelry and works in metal, stone and wood. 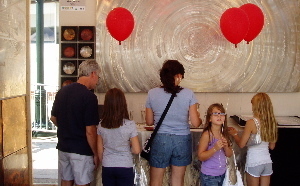 Come see why the Old Town Art Fair has been voted #1 Art Fair in the country for the 4th consecutive year! Naperville Settlement, 523 S. Webster St.
Bartlett Park, North Ave.& Eastern St.
Juried fine art festival returns to the beautiful shaded Bartlett Park. This event takes place on the streets of Geneva, a nice small town in western Chicagoland. Quality of the work exhibited is very high, containing a good balance of fine art and contemporary craft. Lyons School, Waukegan and Lake Ave. Port Clinton Art Festival attracts more than 250,000 art enthusiasts from places near and far. More than 300 of the world’s most celebrated artists come together to showcase their work over the course of the weekend, creating an atmosphere brimming with renowned creativity. 2300 N. Oakley Ave & 2300 W. Lyndale St. The festival features live music and great food from on-site and neighboring restaurants. Fun art activities for kids makes the Andersonville Arts Fest a destination for art enthusiasts of all ages. In 2010 the Andersonville business area was named a National Historic District because of its rich cultural and architectural history. Andersonville Arts Fest caps off the annual Andersonville Arts Week, a celebration of artist receptions, exhibits, and displays at more than 70 businesses well-attended by the community. Benefits local youth group C.R.O.Y.A. Live music, BBQ cookout, homemade ice cream, etc. This event is full of DIY crafters. Expect crafty people who were traditionally rejected by the fine art fairs. Sounds like fun! Held at The Sanctuary Plainfield, 24216 Lockport St.
135 carefully selected artists from across the country show up at this lovely place to show their fine art. A wonderful place to spend a fall day shopping for just the right piece of art. Presented by the Tall Grass Arts Assn. The second-oldest juried art fair in the Chicagoland region, the fair features 90+ artists exhibiting in a range of media from painting, pastels, and photography to glass, ceramics, jewelry, and wood. Known as an exceptionally “artist friendly fair,” several of the artists have exhibited continuously for nearly four decades. Other, newer artists are returning from as far away as Florida and California. The Village of Park Forest will host a music fest on Saturday showcasing four bands that perform jazz, pop, and blues. On Sunday, fest favorites Patchouli will perform. The fair includes many activities for young children such as an art contest, mural painting, tie dying, stories and art activities offered by the Park Forest Public Library and more. The Tall Grass Arts Association Gallery will be open during the fair and is featuring “Explosive Expressions: the Annual Gallery Artists Exhibit.” The Gallery and the fair are open to the public, free of charge. For additional information or a map to Park Forest, see the Tall Grass Arts Association website at www.tallgrassarts.org, its Facebook page, or call the gallery at (708) 748-3377. This fine event is one of the top in the country in terms of consistency of high- quality gallery quality fine craft. There is a wide variety of contemporary work for the true collector. Now in its 6th year, the Festival features an impressive multi-cultural and multi-generational lineup of Chicago artists and performers, and is rapidly growing into one of the city's premier artistic events. The event’s combination of welcoming and relaxed “neighborhood block party” atmosphere and “big city” caliber art sets it apart from other art shows and attracts thousands of art lovers and buyers from all over the city. A gallery-presented, international art exposition dedicated to bridging the worlds of design, decorative and fine art. Works by emerging and established artists and designers are available for sale. Flea Market, French Bistro Cafe, music. Benefits Mothers Trust. WCE Holiday Bazaar features artists who design and/or hand-make their own wares. The 19th annual One of a Kind Holiday Show is a 4-day show that offers the ultimate holiday shopping experience including more than 600 makers from North America presenting hand-crafted and specialty items, artwork, festive food offerings from gourmet vendors, fashion shows and live music. The One of a Kind Show is the ideal place to find truly unique gifts for the holidays, the show features a wide range of price points and media/categories including accessories, bath & body, ceramics, fashion, fiber art, furniture, glass, gourmet, holiday, jewelry, kids, metal, mixed media, paintings, pet products, photography, sculpture and wood. In addition to shopping directly from artists, attendees will enjoy artist demonstrations, crafting workshops, fashion shows, gourmet cafes and live music. A carefully-curated experience showcasing handmade, tailor made, custom made, homemade, loft made, city made, kitchen made, well made, finely made, creatively made, uniquely made, precisely made, beautifully made, perfectly made, outrageously made, delicately made, in-your-face made, and deliciously made. A day for those in search of the next great thing to come see, taste, drink, try on, wear, enjoy, fall in love with, buy and own. To reserve your parking spot for MADE, visit the Morgan Manufacturing SpotHero Parking Page and book a spot with rates up to 50% off drive-up. Visit Christmas-decorated period houses in historic Marengo and Union townships, and view arts and crafts available for purchase at these locations. 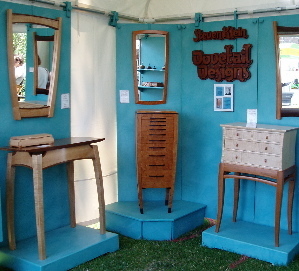 Over 600 of North America's best artists & craftspeople. Immerse yourself in the unique shopping experience of the 18th annual One of a Kind Show and Sale® Chicago. From one-on-one chats with 600 of North America's best artists and craftspeople, to the discovery of thousands of matchless items, it's hard not to find something for everyone on your list this holiday season. Allow yourself a little time, perhaps a lot of time, to explore the distinctive items that can only be found at the One of a Kind Show. Mill Mart, 2153 W. North Ave. This show is an opportunity to shop for one-of-a-kind gifts and original works of art. MADE. It’s about the passion Makers put into what they do … and the work they make. February is only 4 days from Valentine’s Day and only 3 days from Galentine’s Day. Parking? Book parking in advance through SpotHero. You know you love art fairs, but did you know that artists, just like stores, sometimes have leftover inventory and/or 'seconds'? This amazing event at the fairgrounds really brings out the bargain hunters. Get there early to get the best deals in painting, photography, jewelry, clothing, ceramics, glass and more. I AM AN ESTABLISHED ARTIST AND PAINTER AND WOULD LIKE TO KNOW HOW I CAN GET A BOOTH AT SOME FESTIVALS THIS SUMMER. ANY INFO WOULD BE GREATLY APPRECIATED. THANK YOU! Hello Bob, I think I know what you need. You need to get a Calls for Artists from www.CallsforArtists.com. We don't allow calls for artists to be put here. However, we only list juried art shows. Check out our website and see if it works for you. I have inside and outside spots available. We get 15,000 people on average over the weekend. Art for Animals 2nd showing at beautiful KLAS in cicero, IL. Hello Wendy, Thank you for alerting me to that mistake. I have corrected it. We strive to keep our calendar as correct as possible and appreciate you contacting us. Please correct your post for the 21st Annual SOFA show in November, not October. According to their website, the SOFA show is November 7-9, 2014. See http://www.sofaexpo.com/chicago/visit#dates. Hello Linda, That is a very good question. The little asterisk means that I have checked and verified the show's dates and they are correct. The asterisk really is to help me. When I up-date the calendar I know that I need to work on the shows that don't have an asterisk. I am sure there are others who are also wondering what the asterisk means. And now they know, too. What does it mean if a show's name has an asterisk? However, keep in mind that we only list juried art shows on our calendar. 10% of sales will be donated to various animal conservation causes. Hello Jay. We certainly appreciate being updated on the changes for this show. We don't always find out until an art patron can't find the show as listed. So, thanks for helping us keep our calendar as correct as possible. I wanted to make sure that everyone knows Ravenswood Remix is now called Remix Chicago. Our event will take place 8/31-9/1 but we are now located on Milwaukee Ave. between Fullerton and California, in the Logan Square neighborhood.